Paul has been working so hard on repairing the dry-stone walls (with the help at various points of our willing volunteers). It's a huge job. 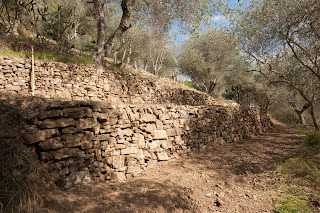 I have a wonderful Italian book all about the terraces and dry-stone walls in this area and going by their calculations we estimate that it took one person 2 years full-time to terrace our land and build those walls. I would say there isn't a single wall that doesn't need repairing so you can see what a big job we have on our hands. It looks amazing when they are finished though. It's an ongoing job and one we do in between other jobs. Sometimes there's even a grant from the Regione for doing it which always helps the finances.